Separation of video streams into foreground and background components is a useful and important technique in video analysis, making recognition, classification and scene analysis more efficient. In this paper, we propose a motion-assisted matrix restoration (MAMR) model for foreground-background separation from video clips. 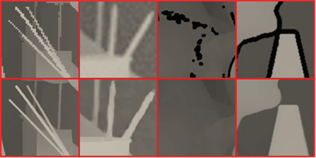 The backgrounds across frames are modeled by a low-rank matrix, while the foreground objects are modeled by a sparse matrix. To facilitate efficient foreground-background separation, a dense motion field is estimated for each frame, and mapped into a weighting matrix which indicates the likelihood that each pixel belongs to the background. Anchor frames are selected in the dense motion estimation to overcome the difficulty of detecting slowly-moving objects and camouflages. Then the foreground is computed by the background subtraction technique using the recovered background image. In addition, we extend our model to a robust MAMR model (RMAMR) which is robust to noise for practical applications. In the experiment, we compare our MAMR and RMAMR models with other state-of-the-art methods on challenging datasets. Experimental results demonstrate that our method is quite versatile for surveillance videos with different types of motions and lighting conditions, and outperforms many other state-of-the-art methods. This paper proposes a novel algorithm to estimate the noise level function (NLF) of signal-dependent noise (SDN) from a single image based on the sparse representation of NLFs. Noise level samples are estimated from the high-frequency discrete cosine transform (DCT) coefficients of nonlocal-grouped low-variation image patches. Then, an NLF recovery model based on the sparse representation of NLFs under a trained basis is constructed to recover NLF from the incomplete noise level samples. Confidence levels of the NLF samples are incorporated into the proposed model to promote reliable samples and weaken unreliable ones. We investigate the behavior of the estimation performance with respect to the block size, sampling rate and confidence weighting. Simulation results on synthetic noisy images show that our method outperforms existing state-of-the-art schemes. The proposed method is evaluated on real noisy images captured by three types of commodity image devices, and shows consistently excellent SDN estimation performance. The estimated NLFs are incorporated into two well-known denoising schemes, non-local means (NLM) and BM3D , and shows significantly improvements in denoising SDN-polluted images. 3D motion estimation from multi-view video sequences is of vital importance to achieve high quality dynamic scene reconstruction. In this paper, we propose a new 3D motion estimation method based on matrix completion. Taking a reconstructed 3D mesh as the underlying scene representation, this method automatically estimates motions of 3D objects. A “separating + merging” framework is introduced to multi-view 3D motion estimation. In the separating step, initial motions are first estimated for each view with a neighboring view. Then, in the merging step, the motions obtained by each view are merged together and optimized by low-rank matrix completion method. The most accurate motion estimation for each vertex in the recovered matrix is further selected by three spatio-temporal criteria. Experimental results on datasets with synthetic motions and real motions show that our method can reliably estimate 3D motions. Keywords: Dynamic 3D reconstruction, spatio-temporal sampling, spatio-temporal fusion, low-rate cameras. This work proposes a new approach for non-rigid structure from motion with occlusion, based on sparse representation. We address the occlusion problem based on the latest developments on sparse representation: matrix completion, which can recover the observation matrix that has high percentages of missing data and can also reduce the noises and outliers in the known elements. We introduce sparse transform to the joint estimation of 3D shapes and motions. 3D shape trajectory space is fit by wavelet basis to achieve better modeling of complex motion. Experimental results on datasets without and with occlusion show that our method can better estimate the 3D shapes and motions, compared with state-of-the-art algorithms. This work proposes a video super-resolution method based on an adaptive superpixel-guided auto-regressive (AR) model. The key-frames are automatically selected and super-resolved by a sparse regression method. The non-key-frames are super-resolved by simultaneously exploiting the spatio-temporal correlations: the temporal correlation is exploited by an optical flow method while the spatial correlation is modelled by a superpixel-guided AR model. Experimental results show that the proposed method outperforms the existing benchmark in terms of both subjective visual quality and objective peak signal-to-noise ratio (PSNR). The running time of the proposed method is the shortest in comparison with the state-of-the-art methods, which makes the proposed method suitable for practical applications. With the advances of depth sensing technologies, color image plus depth information (referred to as RGB-D data hereafter) are more and more popular for comprehensive description of 3-D scenes. 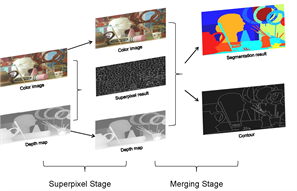 This paper proposes a two-stage segmentation method for RGB-D data: 1) oversegmentation by 3-D geometry enhanced superpixels; and 2) graph-based merging with label cost from superpixels. In the oversegmentation stage, 3-D geometrical information is reconstructed from the accompanied depth map. Then, a K-means-like clustering method is applied on the RGB-D data for oversegmentation using an 8-D distance metric constructed from both color and 3-D geometrical information. In the merging stage, treating each superpixel as a node, a graph-based model is set up to relabel the superpixels into semantically-coherent segments. In the graph-based model, RGBD proximity, texture similarity, and boundary continuity are incorporated into the smoothness term to exploit the correlations of neighboring superpixels. To obtain a compact labeling, the label term is designed to penalize labels linking to similar superpixels that likely belong to the same object. Both the proposed 3-D geometry enhanced superpixel clustering method and the graph-based segmentation method from superpixels are evaluated by quantitative results and visual comparisons. 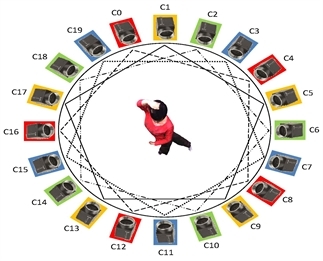 By fusion the color and depth information, the proposed methods achieve superior segmentation performance over several state-ofthe-art algorithms. This work proposes an adaptive color-guided autoregressive (AR) model for high quality depth recovery from low quality measurements captured by depth cameras. We observe and verify that the AR model tightly fits depth maps of generic scenes. The depth recovery task is formulated into a minimization of AR prediction errors subject to measurement consistency. The AR predictor for each pixel is constructed according to both the local correlation in the initial depth map and the nonlocal similarity in the accompanied high quality color image. We analyze the stability of our method from a linear system point of view, and design a parameter adaptation scheme to achieve stable and accurate depth recovery. Quantitative and qualitative results show that our method outperforms four state-of-the-art schemes. Being able to handle various types of depth degradations, the proposed method is versatile for mainstream depth sensors, ToF camera and Kinect, as demonstrated by experiments on real systems. Temporal-dense 3D reconstruction for dynamic scenes is a challenging and important research topic in signal processing. Although dynamic scenes can be captured by multiple high frame rate cameras, high price and large storage are still problematic for practical applications. To address this problem, we propose a new method for temporal-densely capturing and reconstructing dynamic scenes with low frame rate cameras, which consists of spatio-temporal sampling, spatio-temporal interpolation, and spatio-temporal fusion. With this method, not only shapes but also textures are recovered. This method can extend to temporal-denser reconstruction by simply adding more cameras or using higher frame rate cameras. Experimental results show that temporal-dense dynamic 3D reconstruction can be achieved with low frame rate cameras by our proposed method. His research interests mainly include multimedia signal processing and communications, computer vision and graphics, computational photographies, and 3D imaging and processing. Reserach activities in his group have being supported by a number of funds listed below, and some recent research topics are introduced with accompanied project pages.